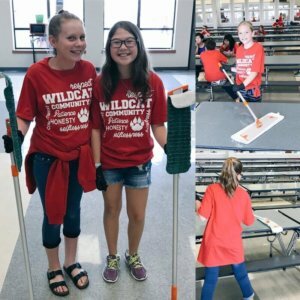 Enterprise Middle School (EMS), located in Richland, Washington, has branded itself as “Wildcat Nation.” EMS won our 2017-2018 Class Act Award for their CharacterStrong Servant Leadership Program, which has made their local news because of its positive impact on the whole community. EMS students forming a “welcome tunnel” to greet people as they enter the building. During Wildcat Cafe, sixth grade student leadership created a hot beverage cafe for fellow students and staff, and even served as the cafe’s baristas. Wildcat students held events to honor two of the often unsung heroes of schools: custodians and bus drivers. They awarded the head custodian the Golden Broom Award in honor of his hard work and dedication. This award included a thirty minute break during the seventh grade lunch period, which he could use to enjoy cookies while the students did part of his work for him. EMS students showed their appreciation for their bus drivers with homemade cookies, hot cider, and meaningful words of thanks. Students and staff organized a Community Strong event to raise awareness about CPR training. The event included a lasagna dinner, silent auction, and involvement of local first responders and health professionals. EMS students participating in a cafeteria clean up. 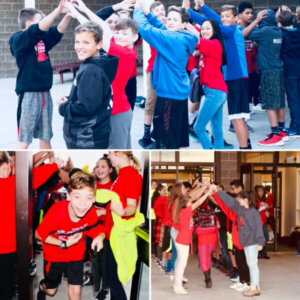 Enterprise Middle School’s counseling website describes CharacterStrong as “more than a curriculum–it’s a culture.” You can learn more about the kindness that EMS students and staff spread in their community by checking out the school’s counseling website and YouTube playlist. We are so proud of the difference that Enterprise Middle School is making in the community! We challenge all of you to adopt their daily question: What will you do for others today? Do you know an awesome group of students who deserve to win our Class Act Award? You can learn more about nominating them here.